Estrogen receptors are members of the nuclear receptor steroid family that exhibit specific structural features, ligand-binding domain sequence identity and dimeric interactions, that single them out. The crystal structures of their DNA-binding domains give some insight into how nuclear receptors discriminate between DNA response elements. The various ligand-binding domain crystal structures of the two known estrogen receptor isotypes (α and β) allow one to interpret ligand specificity and reveal the interactions responsible for stabilizing the activation helix H12 in the agonist and antagonist positions. The physiological effects of estrogens have long been considered mediated by a single nuclear receptor (estrogen receptor α [1,2]) through which the signal is transduced to the transcriptional machinery and chromatin template of target responsive genes. The cloning of a second estrogen receptor (ER) isoform (ERβ) ([3,4,5] and references cited therein) stimulated interest in the search for differences in tissue distribution and functioning. The ERs (ERα and ERβ) belong to the nuclear receptor (NR) superfamily representing a large group of transcriptional regulators that encompass receptors for steroid and thyroid hormones, retinoids, vitamin D, peroxisome proliferator-activated receptors and orphan receptors for which no ligand has until now been characterized. The structural organization of NRs consists of six functional regions (A-F) showing various degrees of sequence conservation (Fig. 1a). The N-terminal A/B domain, not well conserved among NRs, contains the autonomous transactivation function AF-1. The size of the domain is extremely variable, and large A/B domains, extending beyond 550 residues in the case of the human androgen receptor, characterize steroid receptors. This domain is also poorly conserved between the two ER isoforms (with little or no detectable similarity, 17% identity). No clear secondary structure can be identified in these regions and no structural data have until now been obtained. We will thus focus on the better characterized parts, for which functional and structural data are available, such as the highly conserved C region harboring the DNA-binding domain (DBD) and the conserved E region containing the ligand-binding domain (LBD). The two remaining regions, D and F, are again of variable size and are not conserved: D can be considered as a linker peptide between the DBD and the LBD, whereas F is a C-terminal extension region of the LBD. Both ERα and ERβ share a modest overall sequence identity (47%) . The conservation, however, is much higher when considering the DBD and LBD domains (94 and 59%, respectively) (Fig. 1a) . Ligand-binding experiments revealed high affinity and specific binding of estradiol to both ERα and ERβ isotypes, which both stimulate transcription of an ER responsive gene containing an estrogen responsive element (Fig. 1b), in an estradiol dependent manner . No obvious differences between the two isotypes alone or combined were observed in estrogen responsive element transcriptional assays in the presence of estradiol. Some synthetic or naturally occurring ligands nevertheless have different relative affinities/activities for ERα versus ERβ , which will be analyzed in the light of the crystal structures. (a) Schematic representation of the functional domain organization of nuclear receptors. The percentages of identity with human ERα are given for the DBD and LBD of human ERβ, human PR, and human RXRα. (b) The consensus sequence for steroid nuclear receptors and the ER response element. The DBD of the two ER isoforms share the same response elements. As DBD structures for only ERα are available, the comparison will be made with other NRs, especially with the glucocorticoid receptor (GR) . Several three-dimensional structures (nuclear magnetic resonance as well as X-ray investigations) are known for ERα DBD alone and in complex with DNA [7,8,9,10]. The topology of ER DBDs (Fig. 2a) is characterized by a zinc finger-like motif with eight cysteines that constitute the tetrahedral coordination of two zinc ions. Residues participating in the 'D box' have been shown to be involved in the dimerization interface, whereas residues present in the 'P box' are implicated in specific interaction with DNA and are in contact with the central base pairs of the palindromic response element (Fig. 2b). The structural data now available from different nuclear receptors provide clear insight into the response element discrimination problem. For the steroid receptors GR and ERα, DBDs are monomers in solution and form dimers when bound to their respective response elements. DNA thus acts as a positive allosteric effector of its own recognition for binding the second monomer to favor the binding site with a correct spacer length [6,10]. The crystal structures of GR DBD in complex with a cognate (spacer= 3) and a nonspecific (spacer= 4) response element (glucocorticoid response element) [6,11] and that of ER DBD interacting with a cognate estrogen responsive element [9,10] evidenced amino acids in the 'P box' interacting with the two discriminating bases (Fig. 2). Discrimination between estrogen and glucocorticoid response elements are made by the two central base pairs of the DNA response element, interacting with residues of the first zinc finger helix going across the DNA large groove [6,10]. (a) Schematic representation of the domain C of nuclear receptors, formed by a zinc finger motif. The residues making the 'P box' and the 'D box' are shown. (b) The three-dimensional X-ray structure of a dimer of ER DBD interacting with DNA. Helices 10 and 11 and some residues of helices 8 and 9 are involved in the interface. The LBD is a globular domain that harbors a hormone binding site, a dimerization interface (homo- and hetero-dimerization), and a coactivator and corepressor interaction function. Despite low sequence identity in LBDs of the NR superfamily (Fig. 1a), the three-dimensional structures of the LBDs are similar. The first reported crystal structure for a steroid receptor was that of ERα [12,13]. Crystals could be obtained from a chemically modified protein that formed a complex with the natural ligand 17β-estradiol. This structure together with that of the raloxifene (antagonist) complex presented concomitantly  led to a structural proposal to explain agonism and antagonism in NRs. ER LBDs are arranged in an antiparallel α-helical 'sandwich' fold that was first described for the human RXRα apolipoprotein LBD . This fold appears to be universal within the receptor superfamily. For the sake of comparison with RXR, helix H2, which does not exist in ER, has been considered in the numbering scheme. The liganded ER LBD (Fig. 3a) contains 11 α-helices (H1-H12) organized in a three-layered sandwich structure with H4, H5, H6, H8 and H9 flanked on one side by H1 and H3, and on the other side by H7, H10, and H11. The ligand pocket is closed on one side by an antiparallel β-sheet and on the other by H12, known to be directly involved in the transactivation function AF-2 by mutagenesis studies , and for which several conformations ('agonist' or 'antagonist' conformations) have been evidenced . (a) Three-dimensional structure of the wild-type ER LBD monomer, with the β-sheet colored in blue. (b) Anchoring of the estradiol in the active site. The 3-hydroxyl group is hydrogen-bonded to Arg 394 and Glu 353 and a structural water molecule represented in green. The 17-β hydroxyl group forms a hydrogen bond with His 524. (c) Superposition of the three-dimensional structure of ERα LBD complexed with estradiol (green conformation), raloxifen and tamoxifen (red and blue conformations). (d) The ligand pocket of human ERβ showing the residues that are different in human ERα. The ERβ residue names and numbers are shown in black, the ERα residue names are in grey. The ER LBDs form dimers within both agonist and antagonist complexes in a manner consistent with solution studies [17,18]. The overall homodimeric arrangement is the same whatever the class of the ligand or the ER isotypes and is similar to that observed in the crystal structure of apolipoprotein RXRα , being a symmetric 'head-to-head' arrangement where each protomer is slightly tilted from the twofold dimer axis. The dimerization interface involves residues from helix H8 up to helix H11, but the most important contact surface is located on H10 through a hydrophobic leucine zipper-like interaction zone and hydrophilic contacts (direct hydrogen bonds or via water molecules). The dimer contacts in both ER isoforms are constituted mainly by helices H10 and H11 [12,19], which are also in contact with the ligand, providing the link between ligand binding and dimerization. However, this dimeric interface may not be universal in the steroid receptor family, as indicated by the crystal structure of the progesterone-bound LBD of the human progesterone receptor (PR) . Unlike the ER, the PR LBD was crystallized with its F region (residues 922-933) that is essential for hormone binding by the PR , GR  and androgen receptor [23,24]. The C-terminal extension adopts a β-strand conformation tightly packed against the core protein contacting helices H8, H9 and H10. This β-strand then forms an antiparallel β-sheet with another β-strand inserted between H8 and H9, and impinges on the dimer interface seen in the ER. As the ER LBDs were not crystallized with their C-terminal F region (residues 553-595), we have to consider the possibility that the present ER dimer interface could be an artifact. Indeed, as the C-terminal end of the LBD of one protomer points towards the other, it is conceivable that an extension after H12 could interfere with the other protomer and perturb the dimerization. Additional structural information will be necessary to solve this problem. Formation of ERα/ERβ heterodimers has been demonstrated in vitro and in transfected cells , but the in vivo physiological role of this cross-signaling is unclear. The three-dimensional arrangement of the heterodimer is not known, but it has been suggested  that it would be the same as in homodimers. Agonist binding induces a conformational rearrangement in the LBD [14,26] resulting in the formation of a specific binding site for the helical NR-box module of nuclear coactivators [16,27,28,29,30]. This binding site is a hydrophobic groove formed by residues from helices H3, H4, H5 and H12, and the turn between helices H3 and H4 (Fig. 3c). The coactivator LXXLL motif functions as a hydrophobic docking module that binds on the surface of the LBD. In the case of ERs , both partial and pure antagonists induce conformations of the AF-2 region that are distinct from that observed in the presence of pure agonists [12,30]. The binding of raloxifene and tamoxifen is accompanied by major structural reorganization in the ternary structure in both ER isotypes [12,19,30]. The large piperidine extension of this ligand provokes steric clashes that prevent the transactivation helix H12 to adopt its characteristic conformation. Instead, H12 lies tightly in the coactivator recognition groove. Note that H12 possesses a NR box-like sequence (LXXML versus LXXLL) that perfectly mimics the interactions made by NR-box peptides in the ERα complex, whereas there is a shift in the H12 position of between 1.9 and 3.2 Å in the ERβ complex. This displacement does not affect the final location of the two key leucine residues, which coincide with the first and third NR-box leucines (Fig. 4). H12 in the genestein/human ERβ complex surprisingly also adopts an orientation that again exhibits fundamental differences in the length, positioning and interactions compared with the 'antagonist' orientation. Sequence alignment of coactivator NR boxes and H12 from ERα and ERβ. 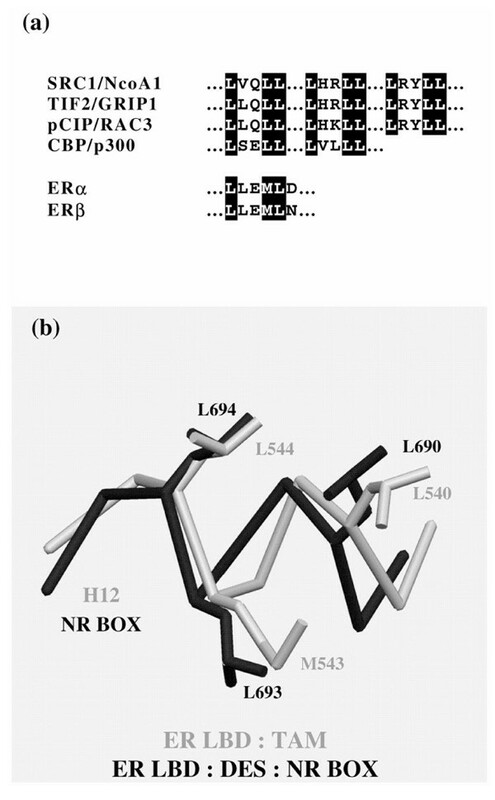 (b) Superposition of the H12 structure from ERα complexed with tamoxifen and the ERα structure complexed with DES and a NR box peptide from TIF2/GRIP1. The first crystal structure of an ERα LBD provided the molecular basis of the interaction of the receptor with its natural ligand 17β-estradiol (E2) . The E2 cavity is completely shielded from the external environment and buries the ligand in a highly hydrophibic environment mostly defined by 22 residues. Two polar regions located at opposite sides of the ligand-binding pocket can be identified (Fig. 3b), and they are involved in the anchoring of the E2 hydroxyl moiety at positions 3 and 17. The phenolic hydroxyl group of the A-ring (3-OH) is hydrogen bonded to Glu353 from H3, and to Arg394 from H5 and a water molecule. The hydroxyl group of the D-ring (17 β-OH) forms a single hydrogen bond with His524 (H11). The cavity delimited by the protein exhibits a probe accessible volume of 450 Å3, which is much larger than the molecular volume of the natural ligand (250 Å3). The probe occupied volume, expressed as the ratio of the two volumes, is significantly higher in the retinoid family. This observation is likely to be general to the steroid receptors family as the PR, for which an LBD crystal structure is available, presents an even larger cavity (603 Å3) . The ER and PR structures superimpose well (1.2 Å rmsd over 191 C α atoms), with the planes of the ligands, defined by the A-, B-, C- and D-rings, almost exactly superimposed. A large amount of data has been accumulated on the binding of synthetic agonist ligands to ERα [31,32]. The crystal structure of the complex of ERα bound to the nonsteroidal ligand diethylstilbestrol (DES) revealed how a synthetic ligand accommodates in the ligand binding cavity . The interactions of DES with ERα are similar to those of E2. The ligand is completely encased in a predominantly hydrophobic cavity with one of the phenolic rings nicely superimposed to the A-ring of E2 and the other phenolic ring shifted 1.7 Å from the position of the 17 β-hydroxyl group of the E2 D-ring. DES contacts two regions of the ligand binding pocket not occupied by E2, located at the 7-α and 11-β positions of E2, and filled by the two ethyl groups of DES. Crystal structures of antagonist bound ERα complexes (raloxifen, tamoxifen) showed that the position of the antagonist ligand in the binding pocket is dictated by the hydrogen bonds to the 3-hydroxyl group corresponding to that of the E2 A-ring and the bulky chain of the ligand that displaces H12 [12,30]. Note that additional structural changes occur near the N-terminus of the H3 region, in the loop connecting H1 to H3 and in the loop connecting H6 to H7. These changes are not imposed by the presence of the bulky chain in antagonist ligands and thus could also be induced by agonist ligands. These structural differences induced by the ligands highlight the intrinsic ERα LBD plasticity. The crystal structure of the human ERβ complex bound to genistein , an isoflavonoid phytoestrogen , is also reminiscent of the E2 complex, especially for the hydrogen bond network around the two hydroxyl groups at the opposite sites of the ligand . The flavone portion of genistein adopts a position similar to the C- and D-ring of E2 in human ERα, with the distal hydroxyl group forming a hydrogen bond to His475 (His524 in human ERα). The remaining flavone moieties exhibit no contact with the protein. The binding cavity of the β-isoform overall is smaller (390 Å3 versus 450 Å3, of which genistein occupies 236 Å3) compared with the ligand-binding cavity in the E2/human ERα complex. Among the residues lining the binding pocket, two differ significantly (Fig. 3d): on the β-side of E2, Leu384 in H5 of ERα is replaced by Met336 in ERβ; and on the α-side, below the E2 D-ring, Met421 in loop 6-7 of ERα is replaced by Ile373 in ERβ. These two residues are most probably responsible for the higher affinity of genistein for ERβ. Together with the genistein/human ERβ LBD complex, the crystal structure of another complex with raloxifene bound to the rat ERβ LBD (raloxifene/rat ERβ LBD) has been reported . In this new complex, raloxifene binds in a position similar to that observed in the human ERα complex (0.52 rmsd between the two ligands once the proteins are superimposed). The major difference is observed in the phenolic ring, where the distal hydroxyl moieties in the two isotypes are 1.4 Å apart. The result of the different position of raloxifene in the beta-isotype is that the piperidine ring pointing outside the cavity is shifted outward (0.9-1.5 Å) and prevents H12 from adopting its agonist position . This shift is most probably responsible for the pure antagonist character of raloxifene on ERβ. The authors wish to thank P Chambon for helpful discussion and critical reading of the manuscript, and are grateful to P Egea and JP Renaud for providing Figures 2 and 4, respectively.